ADVENTUROUS foodies have been testing out a wacky new Scots concept by scoffing down cooked breakfast flavour ICE CREAMS. Mackie’s of Scotland – best known for its frozen treats, chocolate bars and crisps – has been challenging customers to test scoops of ice cream flavoured with chunks of black pudding or bacon. 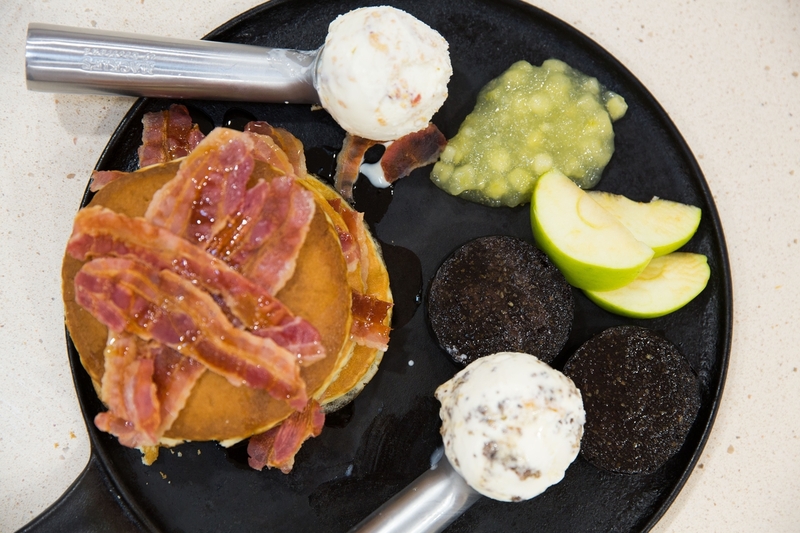 Revellers at the Royal Highland Show have been willing guinea pigs for two flavours, a distinctly Scottish ‘black pudding and apple’ or an American-inspired ‘bacon, maple syrup and pancake’. Now the Mackie’s team hope to establish a winning flavour by the end of the four day extravaganza and say that they could even add it to the list of flavours available in the shops. Bosses at the Aberdeenshire firm, which is still owned and run by three siblings from the Mackie’s family, came up with the idea to produce 30 flavours to help them celebrate the company’s 30th anniversary as an ice cream maker. Karin Mackie, one of the three family directors, said: “One of the many pleasures of bringing 30 flavours to a busy show like this is the instant feedback we get. It is a great sampling opportunity for us. “There’s no doubt the breakfast flavours are about as experimental as you can get with ice cream. For many people the first reaction will be to turn up their nose at the idea, but we are urging visitors to give them a try before making a judgement. “Personally I love the bacon, maple syrup and pancake, but the black pudding is also a striking flavour and is delicious with the apple. It might prove more popular, since black pudding is very much in vogue after being branded a bona fide super food. Both flavours are made using Mackie’s pure dairy traditional ice cream as their base, while the high quality black pudding and bacon from Scottish producers – so the same ingredients thousands of people already fry up for breakfast. As part of the production process the meats are dried out and crumbled into small pieces. Karin added: “We’ve shown in the past that we will try our hand to all manner of limited runs and new ideas, so there is nothing to say we won’t turn one of our new creations from the event into a product you can get in the shops. The sweet-yet-savoury treats have been produced exclusively for the Royal Highland Show, which opened on Thursday and runs until Sunday and will be available while stocks last. Among the 30 flavours on offer are the classics, as well as the more adventurous ‘gin and tonic’ option, while other flavour creations include: ‘banana and Smarties’, ‘blue bubblegum’ and Scottish favourite, ‘cranachan’. 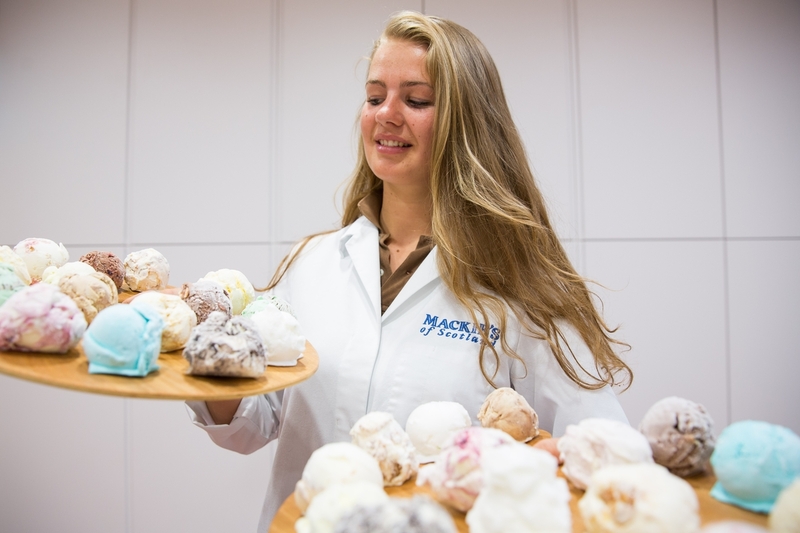 The wide range of freshly made flavours has been made possible by the investment of a state-of-the-art gelato machine, which is now taking pride of place in the Mackie’s of Scotland development kitchen. It is able to turn the firm’s secret recipe into smooth and luxurious ice cream in just six minutes before having swirls, sauces and delicious bites added to the tub. Able to produce batches of up to 15 litres at a time, it offers the development kitchen the flexibility to be more creative in producing artisan ice cream for events and small orders. The Royal Highland Show, now in its 176th year, takes place the last weekend in June and will see a range of activities and entertainment from sheep shearing competitions to live cookery demonstrations. Mackie’s, a supporter and regular at the show for over 25 years, started making ice cream in 1986 and still produces all of its flavours using fresh milk and cream from its own dairy herd on the farm. It now boasts state-of-the-art facilities, capable of producing around 6,000 litres per hour and up to 15 million litres per year. If you think your business could benefit from creative and attention grabbing Award winning Food and Drink PR then don’t hesitate to contact us!